I never really made breads before but lately I've been trying out some different kinds. There's the good old fashioned banana bread, zucchini bread (my favorite), and one that I never would have ever thought of: strawberry bread. I attended a cooking class a couple weeks ago and one of the other attendees and I got to talking. She was a sweet, older woman and we found out that we had quite a bit in common in terms of food. We liked the same things and grew up with the same foods so it was only natural that we went into detail about specific dishes. We're both part Polish so you can probably imagine the types of foods we relished over - Golabki (stuffed cabbage rolls), the ever popular kielbasa (Polish sausage), and some others that brought up some horrible memories of my grandma plucking a duck. Those are stories that I'll save for my son when he's older so he appreciates the fact that I've never squeezed out a duck over the kitchen sink. Okay...back to the task at hand. Please erase the previous description from your mind. While we were talking, this woman was telling me all about her childhood and the things her grandmother used to make. One of those things was strawberry bread. 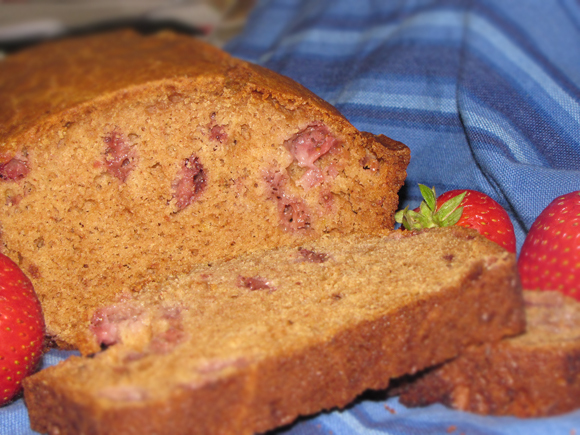 I was intrigued because I had honestly never heard of strawberry bread before. I know...I'm sheltered. 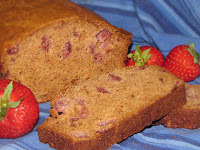 I grew up on artichokes and oysters but never had strawberry bread. I find that odd. Anyways, that strawberry bread made it's way into the little food-thinking area in my brain and before I knew it, I was buying a pint of strawberries at the store. The version the woman told me about used the frozen strawberries that are packed in sugar, but that sounded too sweet. Fresh strawberries seemed like they would fair well so I gave it a shot. Well, I sure am glad I made this and got to experience this strawberry bread. It was subtly sweet with a hint of strawberry flavor and just so...different. I served it up with some strawberry cream cheese for added oomph and it was quite tasty. The recipe yields two loaves so I gave one to one of my food testers: my mom. She approved and that's all the confirmation I needed. 3. Mix flour, baking powder, baking soda, salt, and cinnammon together in a medium-sized bowl. 4. In a separate large bowl, whisk together eggs, sugar, vanilla and oil. 5. Add the flour mixture to the egg mixture in three batches, incorporating all before adding then next. 6. Fold in strawberries directly from the freezer with any juices. 7. Spray two 9"x5" loaf pans with non-stick cooking sprays and pour batter evenly between the pans. 8. Bake for 55 - 65 minutes or until golden brown and toothpick inserted in center comes out clean.